In the late spring of this year Frazier Motorcar Company was offered an Austin Healey 3000 from a broker out of state. When looking at the photos of the car, Jeff realized there were several rare exotics situated behind the Healey and asked the broker what the vehicles were. His reply was, "It's junk! ", but Jeff had a feeling it may be something more. 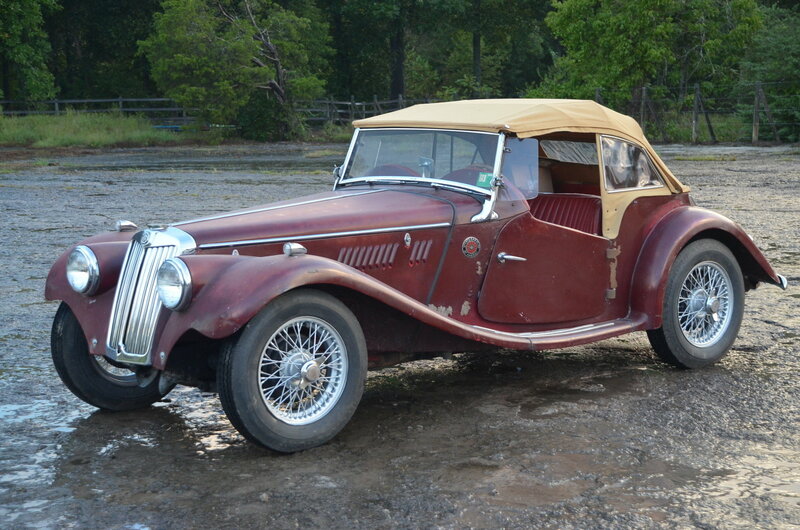 He asked the broker for the address of the the vehicle in Alabama so he could see the Healey for himself, but also so he could see exactly what was pictured with it. Upon arriving in Montgomery, AL, Jeff was absolutely overwhelmed. His hunch was correct, these cars were not junk. It was one of the largest and rarest collection of British cars he'd seen in his career. He left feeling like he may be too old to tackle such an assortment of vehicles, but on the drive home he knew in his heart that this kind of opportunity would never come again. Thus, he undertook the adventure of acquiring the Gunter collection. A journey that would take him the entire summer and well into the fall, but has become one of the most interesting and labor intensive acquisitions of his 40 years in the car business. Mr. Gunter, the former owner of these vehicles, was an avid collector. He boasted a congregation of 34 British cars, many pre-WWII. All of them in various states of restoration. Some of which he was the original owner. Jeff decided to purchase 13 of the 34. Each car was so rare and eccentric it took two months of market research to discern prices and finalize the sell. But that was only the beginning. Starting in June, there had to be 4 truck loads brought from Alabama to Tennessee of inoperable vehicles, some more than 70 years old. Once they arrived in Tennessee, the trucks had to be met with a tow truck to get each car off the ramps and into Jeff's personal barn for safe keeping until he could get each one prepared for the market. When the cars arrived, Jeff and his 15 year old son, Keane, had to make several journeys to Montgomery in the sweltering heat of the southern summer to sort out the cache of parts for the cars. Tucked away in attics and garages, each part was separate from the others. Most were packed away in unmarked boxes alongside old albums and Christmas ornaments. This meant they had to go through each and every box just to find one dipstick for an MG or a steering wheel for a Jaguar. By the end of the summer, Jeff felt he could begin to take inventory of his new collection and begin the daunting, yet exhilarating, process of getting them ready for market. Jeff now had two Triumph 2000 cars, a 1948 Jaguar MK IV Coupe, a 1954 Jaguar XK120 Coupe, 1954 Jaguar XK120 Roadster, a 1960 Jaguar MK IX, a 1963 Jaguar MK III 3.8s, a 1936 MG PB, a 1938 MG TA Tickford, a 1949 MG TC, a 1954 MG TF, a 1960 MG A Coupe, and rarest of all, a 1932 MG F1 Magna. Only 6 F1 Magna's have been traded over past decade, selling for prices between $68,000 and $335,000. Each car has its own personality, backstory, and fanbase, so Jeff is now spending the autumn nights getting to know each car. And learning that with each model, there comes a new surprise. 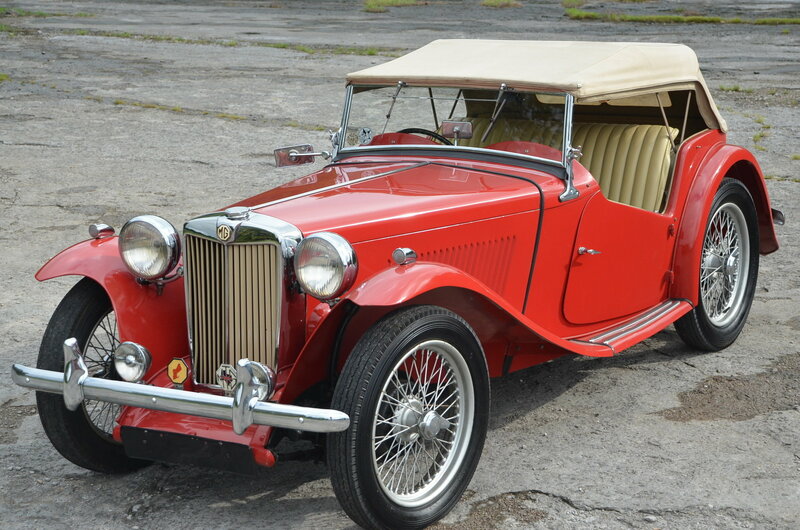 Thus far, Frazier Motorcar Company has been proud to present the 1949 MG TC and the 1954 MG TF to the public. While the MG TC has found a happy new home, the MG TF with it's well-worn bomber jacket patina can be found in our inventory. We look forward to presenting each of these incredible and rare examples with our customers in the coming months, and we hope that you appreciate the history and character each of them has to offer!